In the course of the past few “Free For All” discussions we’ve had about the blog, a recurrent theme is the difficulty of finding things we might be interested in. Many folks have considered it a big drawback that we can’t organize the posts by topic on separate pages. Actually, it’s intuitive once you get the hang of it. 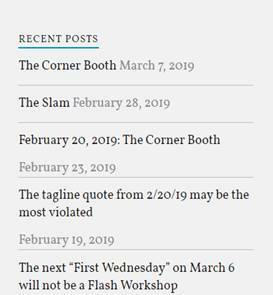 “The Corner Booth” and “Writing (noun and verb)” – if you click on either of those links you’ll get a list showing all the posts that have that category assigned. Since “Writing…” is the default category, you’ll get a ton of posts, and since we’ve only just begun filing TCB as a post, you’ll only get a couple. which is exactly what it says it is – click on any item in the list and shazaam, there you are. Which is a compiled listing of authors and their posts. Click on any author heading and you get a page with a complete list of that author’s posts. which is – guess what – a dropdown list of our post categories. Select one and …wait for it … you get a page with the posts in that category. really is all there on the home page. I wonder if displaying a tagging system would also help people navigate. I’ve been tagging my posts (they show up at the bottom of the post). Tagging offers a little more specificity than the categories. I remember in the LiveJournal days, tag “word clouds” seemed to be the popular thing. 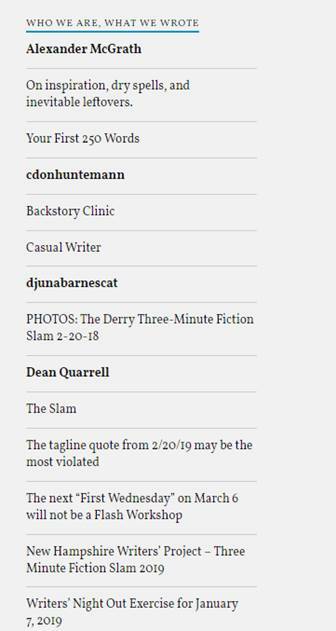 They showed up on the side of the blog as a sort of run on list of tags, each of which increased and decreased in size depending on how often they were used. It made it easy for people to find posts on particular topics. Good idea – done! Thanks Jennifer.